I assure you, no one can enter the Kingdom of God without being born of water and pneuma. 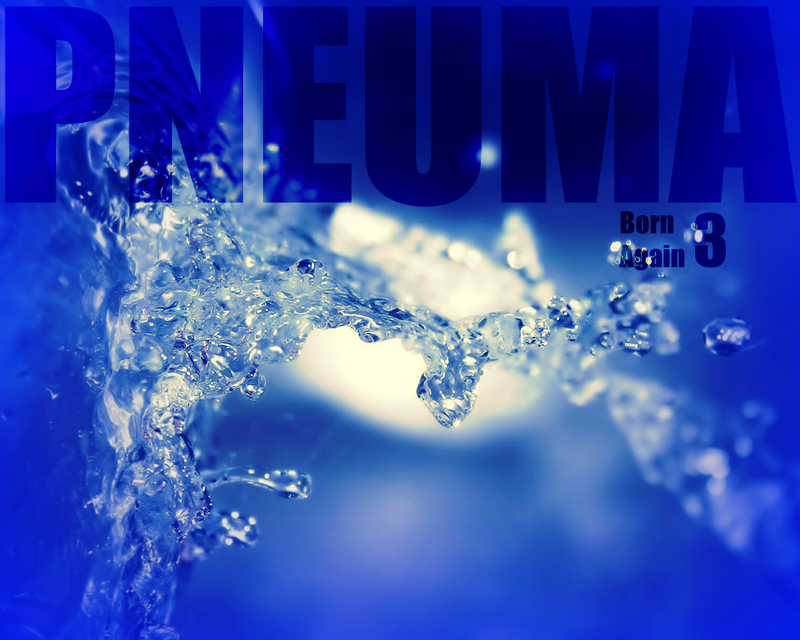 Humans can reproduce only human life, but pneuma gives birth to pneuma. So don’t be surprised when I say, ‘You must be born again.’ Pneuma blows wherever it wants. Just as you can hear it but can’t tell where it comes from or where it is going, so you can’t explain how people are born of pneuma. The thing is, to an ancient Greek, the word doesn’t just mean wind. Outside of scripture it is often used to mean “breath” and it is from this concept that the philosophers began using it to mean “spirit”. The philosophers believed there was a wind inside of us that gave birth to our thought and our will. Pneuma was a key concept of Stoic philosophy. They used it to mean “breath of life” and believed that our pneuma was a combination of air and fire. So let us look at Jesus words again translating the word pneuma as “breath” where we would see “spirit”. I assure you, no one can enter the Kingdom of God without being born of water and breath. Humans can reproduce only human life, but breath gives birth to breath. So don’t be surprised when I say, ‘You must be born again.’ Wind blows wherever it wants. Just as you can hear it but can’t tell where it comes from or where it is going, so you can’t explain how people are born of breath. React: When God created Adam, He formed him from the dust of the ground. He then breathed on him and it was only at this point that Adam became a living person. Forgive me for the interpretative license but I would say that, in a sense, when Adam and Eve disobeyed God and ate the fruit, they exhaled. They breathed out,. They rejected the Breath of Heaven. From that point forward people were born and living sacks of dust and water. They went through the functions of life but they were not truly Alive. Every now and then scripture would say that the Spirit, the breath, would come on someone, but it didn’t really enter in. Something was missing. In the end of John, the first time Jesus meets up with His disciples after His resurrection, what does He do? He breathes on them. Then He tells them “receive the Holy Spirit.” What was lost has been found. They have come alive. The breath of heaven has come to dwell in them. God, breathe on me again. I am desperate for the wind of Your Spirit. It is in You that I have life. It is through You that I can breathe. You are my source. You are my purpose. All that I have, all that I am is Yours. Let Your Spirit move me and carry me and sustain me and direct me. I am desperate for You. You alone are my life. Breathe on us, Holy Spirit, that we might live to the glory of God. Amen! Your writings are very inspirational, BJ May our Lord continue to inspire you as you glorify Him. Well written! This reflects a good bit of research and study into the topic. Thanks for sharing this. BJ, this is a beautiful interpretation. Love where you took this. This is a divine interpretation. Thank you Holy Spirit. God bless you BJ. While every Christian has received the regeneration of the Spirit in the New Birth we need the progressive sanctifying influences of the Holy Spirit in order that the work, that has been begun may be developed. A key aspect of sanctification is the infilling of the Spirit. A continual work which Paul likened to one who is drunk with wine. How we need to be under the possession, under the control of the Spirit each and every day? This is what we pray for when we seek the wind of God in the life of the Christian. Something else we pray for is Revival. This occurs when Spiritual Power falls upon an entire company of Christians at once. The course of nations have been altered by such an awakening. The most striking historical example is the Protestant Reformation. The revival in New York in 1858 is another, which eventually spread to Ireland and to the rest of the British Isles. There are other examples of more localised revivals. We must pray for such a Breath from Heaven. revive your church with life and power. till humbly we confess our need. renewing thought and will and heart.